Wonder what goes on inside a K-pop fangirl’s head? Well, wonder no more since Popped lays out all the crazy fantasies that plays out in their (or OUR) minds! But Popped isn’t all fantasy. Chinggay Labrador takes her four main characters all the way to Seoul and sends them into a tizzy. I mean, actually meeting (and by meeting, I mean having a normal human conversation with) their K-pop idols? Only every fangirl’s dream! I have something to confess: I like K-pop and I am a fangirl. Though nowadays that’s nothing new or surprising, *old grandma voice* back in my time, we were far and few in between, especially in the province. 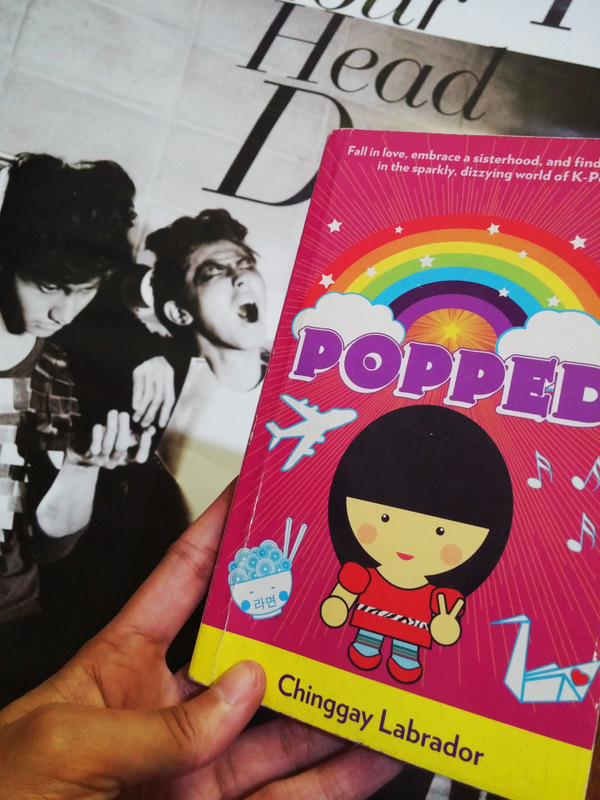 So when I read Popped a couple of years ago, I felt relieved this book captured one of the best things about being a fangirl: the friendships you form with your fellow fans. You guys, fangirls are some of the most supportive friends in the world. No matter how absurd the imagined future you have with your K-pop-celeb-soulmate is, they will gamely cheer you on and make you feel as if it might actually happen. Everyone knows it won’t and that you all look a little insane screaming and giggling and jumping up and down in public, but it doesn’t matter! I think that’s why I gave this book a chance despite my initial doubts. I know what it feels like to have a support group that’s so positive and happy and completely accepting of your weird K-pop obsession. And the friendship in this book definitely epitomizes that to a T.
Amidst all the kilig (and honestly quite unrealistic) moments the characters had with their idols, this book is really about FRIENDSHIP~! Andie, Trixie, Cesca and Nica all bond over K-pop at first but their relationships grow into something more than just their shared love for Korean music and dramas and become something solid, comfortable, and reliable. P.S. There’s also Popped, Too and Popped 3 for your reading pleasure, though I haven’t read the third book. If you have, let me know if I should go ahead and finish this trilogy!